The first one to make a Roman joke gets blasted full of hot energon. If you looked up "lost" in the dictionary, there's a better than even chance you'd find a picture of Centurion next to the definition. Not only is he stranded on a primitive alien planet with no way home, his mind and memories were wiped away in the crash. 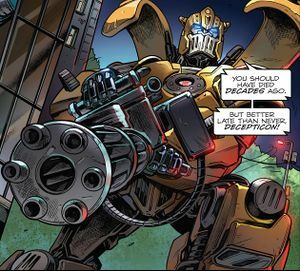 For the majority of human history, Centurion has been known as Bumblebee and fully embraced that identity until the horrors of World War I allowed his true self to break free. The horrors of what Centurion has seen, done and had a hand in creating have chipped away at any optimism he had left, creating a weary warrior with a pronounced hatred for his fellow Transformers, believing his kind brings only destruction. This bleak, ruthless, and pragmatic attitude made Centurion ripe for Garrison Kreiger to prey on, turning the Maximal into the villain's pet enforcer. Recently however, witnessing Autobot and humans working together have begun to reawaken some of the better aspects of Centurion's personality (that and being partially mentally merged with Mike Power). Free to make his own decisions for the first time in twenty thousand years, the future may be looking up for the unlikely bot. The two spent the next fifty years looking for the artifact, eventually finding it in Egypt. In 1994, Centurion witnessed Kreiger's experiments with Atomic Man and the Talisman recall the Axalon back to normal space/time before Power seemingly perished. Joe Colton's Adventure Force then broke into the lab but Kreiger ordered Centurion not to engage. Twelve years later, Centurion was part of Project: Hot House, an attempt by Skywatch to use the Talisman to develop anti-Cybertronian weapons. Luring Sgt. Savage to the base, Centurion chained up the rogue Decepticon Bugly to the Talisman and threw Savage at the device, activating it and atomizing the Decepticon. A further decade later, Joe Colton took on the moniker of "Baron Ironblood" and formed the Iron Ring to try and destroy Cybertron once and for all. When the Revolutionaries stumbled onto the scheme and acquired the Talisman however, Centurion went with Ironblood and Mercy Gale to convince Tomax Paoli to retake the mantle of Cobra Commander. Centurion then drove Paoli to San Francisco to retrieve the date of Project: Ice Man. In the interim, the Revolutionaries had stormed the Iron Castle which prompted Iroblood to cut Centurion loose. When the Revolutionaries arrived in San Francisco however, Centurion revealed himself, believing Kup to be Eukarian straggler. The two quarrelled until Garrison Blackrock convinced Centurion to stand down by revealing there were planets' worth of Cybertronians out there. Feigning a change of spark, Centurion stood down and was sent to the Onyx tower in Buenos Aires. This page was last edited on 16 September 2018, at 00:42.